I’m Molly. 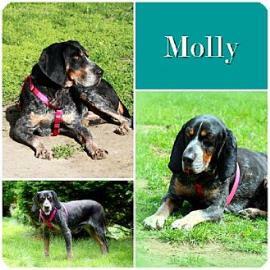 I am an 8 year old lady looking for a home. 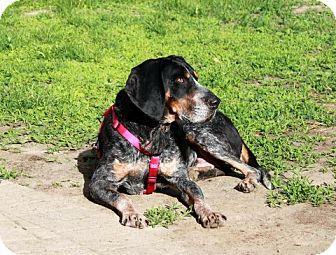 I am a Bluetick Coonhound, (possibly mixed with Hound) from Ohio. I am spayed, house-trained, up to date with shots, good with kids, good with dogs, and good with cats. Basically, I am happy to be around anyone who shows me kindness. I am pretty much the perfect dog, but I do have some medical issues and special needs, which you can find out more about by reading my story. I haven’t had an easy life, you see. I used to live chained to a doghouse surrounded by filth, with only a few pieces of straw for a bed, permitted off of my chain only occasionally to hunt. Now that I’m 8 years old, it seems I have outlived my “usefulness.” Despite how I was treated, I was always loyal to my owner by being a good dog and doing what was expected of me. Unfortunately, because of my age, I became a burden. I tried my best to keep being a fast dog, one who could stick with a scent until the end, but my energy levels have lowered. I still get spurts of energy, but it’s not the same as when I was a younger pup. Before I knew it, I was at risk of being shot or perishing (as others had) through another frigid winter. The night the volunteers brought me into rescue, I had to be rushed to the Emergency Vet because I had been neglected for so long and had developed many health issues. With the determination and dedication of volunteers from the Mid Ohio Animal Welfare League and the Ohio Lurcher Project, I pulled through. My parasites were treated; I gained enough weight to be spayed, received my vaccinations and microchip and had my lumps and bumps removed. Unfortunately, the vets determined that one of my lumps was malignant and it was removed entirely. There is no evidence that the disease has spread at this time. Anyway,that’s me. Thank you for reading my story today! 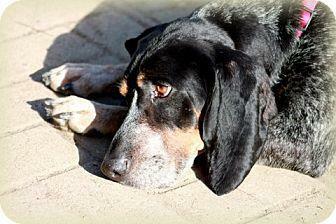 If you or someone you know would like to adopt me, they should contact Gentle Jake’s Coonhound Rescue.